This is not an attempt to give a comprehensive description of Parkinson's disease, but rather to present some basic facts and then give a few examples in the form of films and stories. Please report any errors you can find by commenting on this post. Parkinson’s disease, or PD for short, is an incurable, neurodegenerative and neuropsychiatric disease caused by a lack of the neurotransmitter dopamine in the brain. It affects about 2% of the elderly in the US and the older you get, the bigger the chances are that you will get PD. The drawing to the left was made in 1886 but is probably still a very accurate picture of how most people see PD. "Involuntary tremulous motion, with lessened muscular power, in parts not in action and even when supported; with a proprensity to bend the trunk forwards, and to pass from a walking to a running pace: the senses and intellects being uninjured." James Parkinson, An Essay on the Shaking Palsy, 1817. 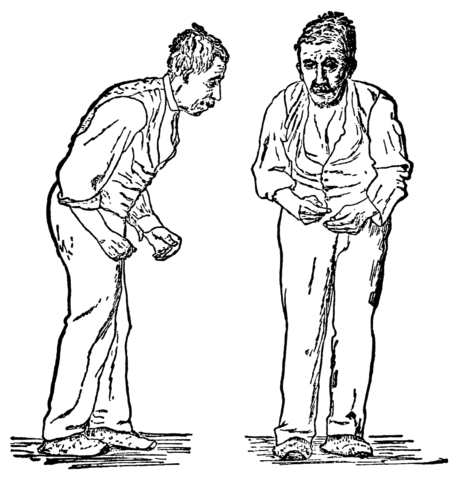 PD is diagnosed on the basis of four cardinal symptoms: tremor, bradykinesia (slowness of movement), rigidity (stiffness), and problems with posture and gait. There are also a large number of non-motor symptoms that a person with PD may experience, where the most common probably are depression and other mood disorders, pain, cognitive problems, sleep issues, and problems with digestion and other autonomic functions. In addition, the available treatments for PD often causes different side effects of varying severity, mainly of a motor function or behavioural nature. Luckily, most persons with PD will not exhibit all of these symptoms or side effects. PD is mostly managed with medication, and persons with PD often take several drugs multiple times a day, 4-6 different prescription drugs up to 6-8 times per day in different combinations is not an unusual regimen. Not only old people can get PD. Sure, most people are old-ish when they are diagnosed with PD, but somewhere between 5 and 10% actually get PD before the age of 50. The condition is then called “Young Onset PD” (YOPD). In some cases, such as my own (see under “personal stories” below), the disease starts under the age of 18 and is then called “Juvenile Onset PD”. Everybody with PD does not have a tremor. About 25% of cases do not have the classical PD tremor. PD is a very individual disease. I have personally met over 1,000 individuals with PD and none of them have probably had the exact same sets of symptoms and treatment as another. PD is an extremely variable condition. Symptoms and signs can come and go literally from one minute to the next, something that of course severely affects the person with the disease. PD is not easy to live with but there is a lot you can do to help yourself if you have it. Knowledge is absolutely essential to manage any chronic disease and especially PD. Medication timing is key in PD. Our medications are what makes us go round, literally. They are like our gasoline AND our transmission fluid combined and I find that being almost religious when it comes to medication timings, really helps me stay as well as I can with this difficult disease. Stay active! Stay active! STAY ACTIVE! The only thing that slows down the progression of PD is physical activity, which is why I try to walk at least 7,000 steps per day and also make sure to challenge myself mentally as often as I can. The World Parkinson Coalition organises the World Parkinson Congress (WPC), which combines scientific content with patients’ interests, making it the best meeting in the world for persons with PD. The next congress will take place in Portland, Oregon, in September 2016. Don’t miss it, I know I won’t! Here are a few personal stories from persons with PD. If you want me to link to your story of PD, comment below or use the contacts page.